At last year’s Creative Industry Day, Noelia Rivera Pagan, then a second-year graduate student in visual communication design, spoke with Caroline Connor, left, and Claire Britt from Punchcut, a San Francisco, Calif.-based design company. 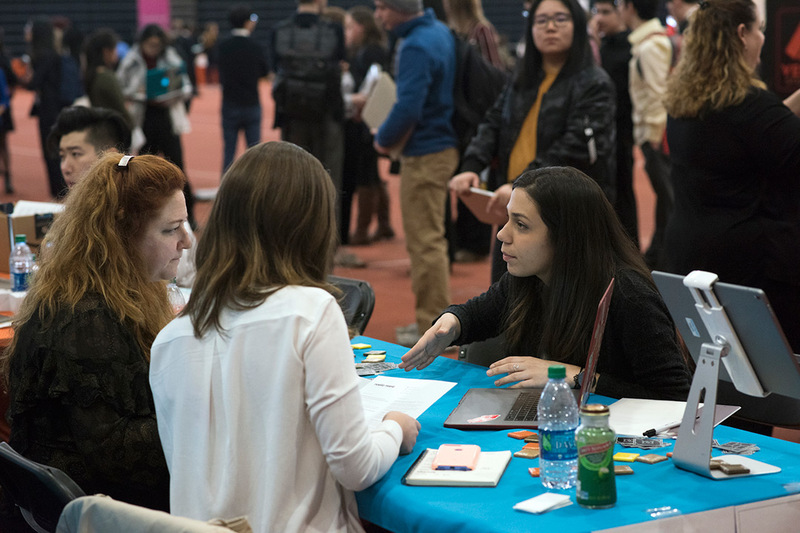 Rochester Institute of Technology’s 14th annual Creative Industry Day, which provides companies like Adobe, Blue Sky Studios and Google the opportunity to meet with RIT’s creative talent in a career-fair setting, is scheduled for Thursday, March 21, inside Gordon Field House. Organized and sponsored each year by RIT’s Office of Career Services and Cooperative Education, Creative Industry Day begins with two career panel discussions—“Young Professionals” from 11 a.m. to noon, and “First Impressions”—followed by portfolio reviews and networking from 1 to 6 p.m.
She added that many of the professionals who travel to campus to attend the event each year include alumni returning to represent their companies or share their experiences and advice to current RIT students. The event will feature a wide range of businesses from large global companies such as Saatchi & Saatchi, Mattel Inc., and Bose Corp., to digital design agencies and visual effects firms from across the country. In all, nearly 70 companies are expected to be on the RIT campus. Students attending the event are encouraged to use the hashtag #RITCreativeIndustryDay on Twitter. For details, go to www.rit.edu/creativity or call 585-475-2301.